Male sources outnumbered female sources in three of the NPR online blogs studied. Online sources in most of the blogs studied were overwhelmingly white. Late in 2015, this office released the third-year results of an internal NPR study examining the diversity of the outside sources heard on NPR's weekday radio newsmagazines. (Outside sources are the people interviewed and quoted by NPR; they do not include NPR's own reporters and hosts.) Now we have a fourth year of that analysis, this time looking at the makeup of the sources that NPR used in five online blogs during the 2016 fiscal year (Oct. 1, 2015, through Sept. 30, 2016). The sourcing project, as it is known internally, is designed to give NPR's newsroom employees a baseline understanding of the gender, geographic and racial and ethnic diversity of its sources — and ultimately push the newsroom to "better reflect the diversity of America." It is overseen by Keith Woods, NPR's vice president for newsroom training and diversity. The newest numbers aren't terribly timely, and two of the blogs tracked in the latest survey were retired in June. But they are nonetheless welcome as the most recent data on how NPR is doing in diversifying its sources. 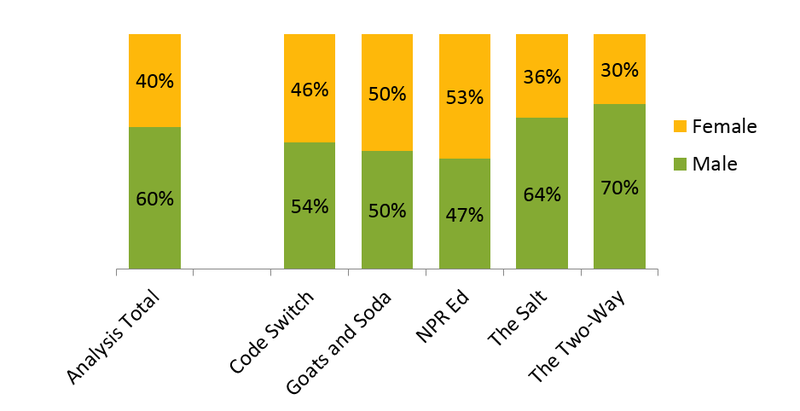 In total, 480 stories quoting 1,259 sources were sampled across five blogs: The Two-Way (a breaking news blog), NPR Ed (about education), Code Switch (race and identity), Goats and Soda (global health and development) and The Salt (food news). The Two-Way and NPR Ed have now been retired. The stories came from random dates during the 2016 fiscal year, and results were weighted to reflect that some of the blogs published more often than others. Sources were excluded if their race, gender and/or geography could not be determined for certain. Overall, 40 percent of the sources quoted were women. The gender breakdown varied somewhat across the blogs: The Two-Way's sources were just 30 percent female, compared to a high of 53 percent for NPR Ed. By contrast, in the last year of the on-air study, fiscal year 2015, 30 percent of all sources were female. The race and ethnicity of the cited sources varied even more widely by blog, from 85 percent white for The Salt and 82 percent white for The Two-Way to 39 percent white for Code Switch. There was one constant, though: The share of Latino sources was low across all the blogs, varying from 5 percent for The Two-Way and Goats and Soda to 9 percent for NPR Ed and Code Switch. One other finding jumped out from the online sources study: Overall, 44 percent of the sources were white men. The study merely collected numbers and was not designed to examine why the numbers are not more reflective of the country. But Woods said that NPR knows from the earlier study that there's a correlation between the diversity of the newsroom and those who are quoted. "It matters who's telling the story when it comes to gender balance and race/ethnicity," he said. The latest newsroom diversity figures are here. In particular, the earlier study showed that "Latinos were the only journalists who could be counted on to cover Latinos," Woods said. He added: "We have to do better at hiring," particularly when it comes to Latinos, and "We have to raise the level of awareness across the newsroom that we are still doing poorly" when it comes to quoting Latino sources. Another reason for the wide difference among the blogs (and also between the blog study and the on-air study) has to do with the specific topics of the blogs themselves, Woods said. NPR Ed quoted far more women at least in part because educators are overwhelmingly female (although it should be noted that the education team intentionally seeks diverse sources). Code Switch's numbers were overall more diverse, he said, because "of the intention of the team," whose focus is issues of race and identity. In its reporting, NPR traditionally over-relies on what the studies referred to as "subject matter experts" (who are more likely to be white and male, if, like NPR, a newsroom turns to professors, politicians and business leaders) than it does sources that could be called the general public. When the blogs in the new study quoted members of the general public, the diversity of the sources was greater than for the subject matter experts. Woods' takeaway from this snapshot? "Who you cover, what topics you cover and who does the covering are strong indicators of the outcome of your sourcing." And, he said, "it's more than just your intention; how you structure things and execute on that structure is also affecting the sourcing." "It's one thing to scour the existing beats and the existing coverage strategy for greater racial/ethnic and gender diversity. Let's do that. But we have to recognize that beat structures — what we cover, what we don't cover — is having a big impact on our sourcing. If you cover a legislative body that's chronically made up of white men, then that'll be your source base. If you spend more time covering the people affected by that legislative body, your source base is way more diverse. If you choose to give more air time to beats where the institutions and constituents are more representative of the country — faith, for example, or public education — you'll have a more diverse source base. These are choices. These are the structures we create. The problem isn't just looking for the occasional needle in a haystack among the narrow coverage choices we've already made." One final factor likely accounts for some of the imbalance, but it's not easily documented. It's the challenge of what experts call "implicit" or unconscious bias — the kind of built-in bias that each of us has because of our own background and experiences. But that's why these kinds of studies are valuable, because they can help people in the newsroom see how their choices of whom to interview affect the overall diversity of information sources for listeners and readers. Indeed, we've been looking at how the newsroom approaches source diversity for the last couple of months (more on that soon) and we've heard one constant refrain: NPR really needs to be tracking this information on a more regular basis. It's a long, laborious and expensive process to come up with results that are reliable and truly representative. But Woods said he now has a commitment and the funding in place to start a new round of tracking. That is a very welcome development.